Three commuters were injured when they were struck by part of a London Underground train. 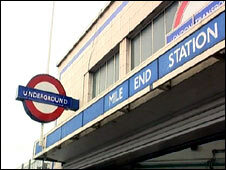 Two women, aged 17 and 37, were treated in hospital for facial lacerations and head injuries following the incident at Mile End on Tuesday. A plastic barrier between carriages broke and hit the commuters when the train entered the east London station. A Transport for London (TfL) spokesman said it is investigating the incident and described it as "very rare". BBC London has been told the fault had been reported prior to the incident, which has been confirmed by TfL. It said all trains across the network have now been checked to prevent another such accident. A TfL spokesperson said: "A protective vinyl barrier that stretches between two carriages came loose from a westbound Central Line train at Mile End and injured three customers, two of whom went to hospital. "Safety is our top priority and we have an excellent safety record, we are investigating this incident, which is very rare." Did you see the incident? Send us your comments using the form below.